Big Bend, Marfa, Alpine, Marathon. Your mobile device tells you that you are in Mexico. You are minimum 6 hours away from any major city – take a look on the attached Google map. You can drive for an hour possibly without passing a single other car – at least close to it. The view out the window looks like you are watching an archetype of a Western movie. 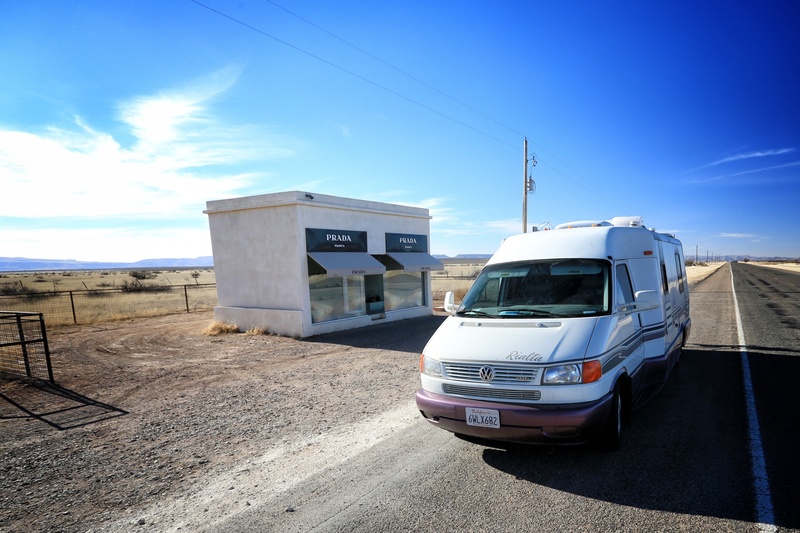 If you pass through Marfa you might jet past the Prada store – 30 miles into the middle of a golden prairie – don’t worry – you don’t need to slam on the brakes to look at it. You can stop slowly and then throw your car into reverse and drive back to it. No one is going to rear end you – you would see them coming from miles away down the perfectly straight highway with untold miles of visibility. Sure, you might get a little freaked out every once in a while that you haven’t seen another car in a while – but the nice part about that is that it’s actually an illusion of sorts – someone will pass by and relatively soon. I think that without question I saw at least one car passing in either direction – and they always wave. Everyone waves here and I am willing to bet if you flag them down and you don’t talk politics and you nod your head in the event they mention God that you would have all of the help you need. Very rough video to get a better idea of just how huge ….. Very cool. Did you feel smaller because of all the space, or larger because you were the only one there? oh man – without question smaller!!!! Very peaceful. contemplative but incredibly humbling and plus an even greater respect for the people from the past who would face a landscape like that with a wagon or a horse and still go for it!